Many people may be satisfied with headphones that are merely good. But SOUL Electronics, maker of high-end headphones, is banking on many audiophiles and others wanting something great. In a new marketing campaign called “SOUL of Greatness,” the company will showcase the stories of leaders in various categories of achievement, most notably athletics and music. In different installments, the campaign will showcase how these leaders turn to music for motivation, use it to block out noise and distraction and get them “in the zone” to accomplish their goals. The first element of the campaign is a 30-second video featuring Jamaican track and field superstar Usain Bolt. 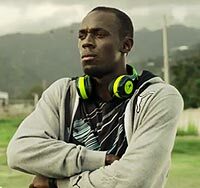 The video shows Bolt walking onto a track in preparation for training, with a pair of SOUL headphones around his neck. As he prepares to run, the scene cuts to a young boy running through the streets of Jamaica and Bolt interacting with other children. The video will be aired on media partners such as ESPN, Maxim, Complex and Clear Channel Media + Entertainment Los Angeles (which also has an exclusive branding partnership for a SOUL by Ludacris Headphone performance studio through Clear Channel Radio). Other marketing initiatives include social media, public relations and events.